Foreign Ministry Spokesman Bahram Qassemi said on Monday that Trump’s “dreams have nothing to do with the existing realities” after the US president said Iran wanted to hold talks with the United States. “They (Iran) are not doing well. They want to talk [with US],” Trump told reporters at the White House on Sunday, claiming that the Iranian economy was badly hit due to his sanctions. “He knows that the Islamic Republic of Iran has been facing and is familiar with American pressures and sanction policies for decades,” Qassemi said. Last year, Trump withdrew the US from an international nuclear deal with Iran and imposed sanctions on the country. As part of building pressure, he has asked other countries to bring down their purchase of Iranian oil to zero. “Throughout their turbulent but proud history, Iranians have learned how to resist expansionists and bullies and defeat those hostile to Iran,” he added. Iran’s foreign ministry denies Trump claim and chalks it up to Trump’s ignorance. Senior Iranian officials have already rejected Trump’s offer of talks without preconditions, saying his words contradicted his action of reimposing sanctions on Tehran. President Hassan Rouhani has said Trump’s repudiation of the 2015 nuclear deal was “illegal” and Iran would not easily yield to Washington’s renewed campaign to strangle its oil exports. Last May, Trump pulled the United States out of the multilateral deal concluded before he took office, later saying that he would be willing to meet Rouhani to discuss how to improve relations. His White House, however, has said that the call for negotiation did not mean the United States would lift sanctions or re-establish diplomatic and commercial relations. 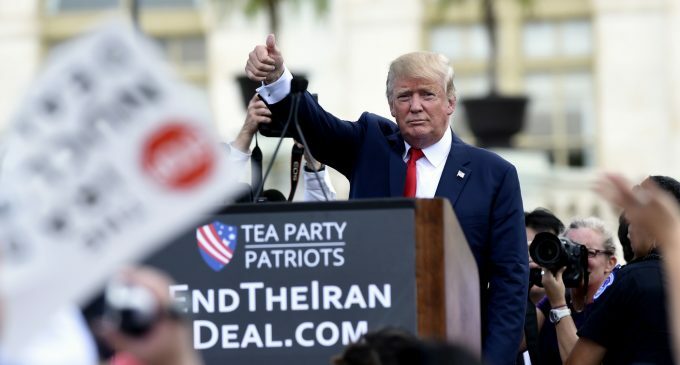 US officials have also launched repeated volleys of rhetorical assault on Iran — with Trump himself calling the country a “terrorist nation” — and promised unspecified backing for groups with a history of terrorism, such as the MKO. On Thursday, US Secretary of State Mike Pompeo said Washington’s tough sanctions against the Islamic Republic were aimed at giving the Iranian people a chance to have better lives. Secretary of Iran’s Supreme National Security Council Ali Shamkhani told a security conference in Tehran Monday that the US was not trustworthy and dismissed claims of Iranian request for negotiations. “Iran has not sent any signal or message for negotiations with the US and the Americans have proven that they are not reliable. The history of negotiations also confirms this,” he said. “Another issue is that it is the Americans – and not the Islamic Republic of Iran – who send messages and announce through their couriers that they are ready for negotiations with Iran,” he added. The post Iran Rejects Trump’s Claims That Tehran Sought Talks With the US as ‘False Dreams’ appeared first on MintPress News.